« Buy your ticket for Oxford Lottery’s first draw! Led by tutor, Roger Perkins, the day will consist of short and sustained experimental drawings of two models in OVADA’s main warehouse space. Using various media the intention is to focus on the possibilities drawing offers the experienced and less experienced student. 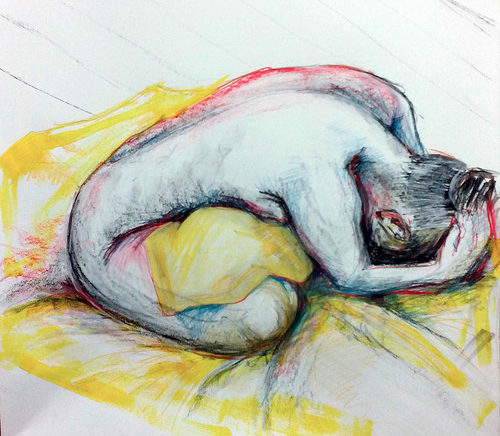 It is hoped that the class will refresh your approach to drawing the model. It will suit all those undertaking Life Drawing for the first time and those wishing to take a fresh uninhibited approach to their personal practice. Basic materials provided however please bring a roll of lining paper and a fine permanent marker pen. Hot drinks will be available all day. There will be a lunch break between 1-2pm. Please bring a packed lunch or alternatively there are a number of shops/cafes nearby.